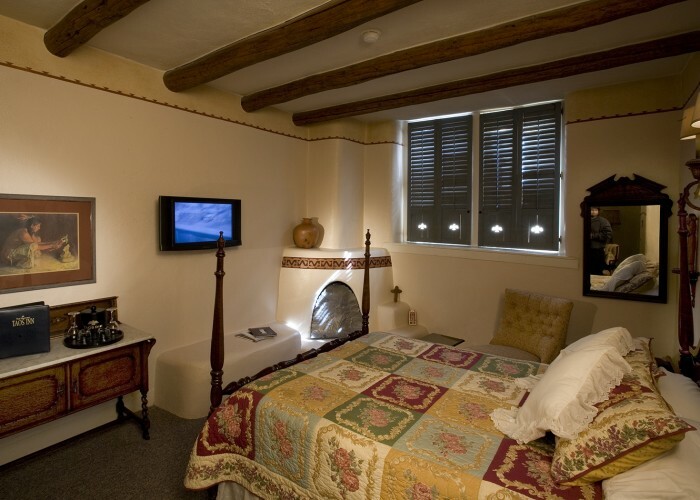 Located in four buildings, the Historic Taos Inn’s collection of 44 guest rooms exudes authentic Southwestern style. 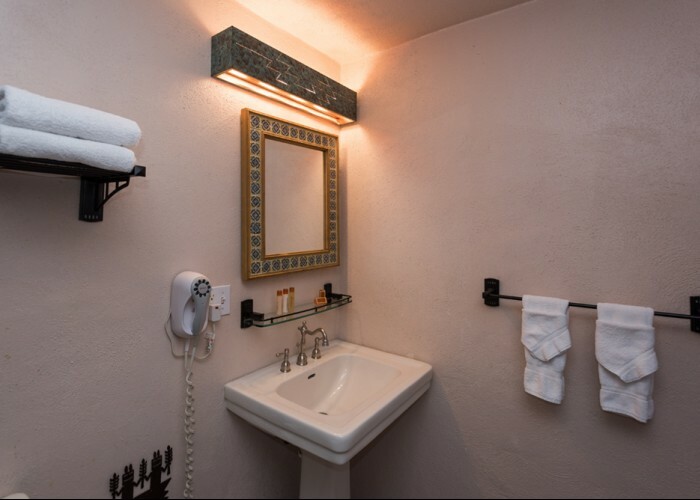 Each is individually decorated, making every room a unique expression of the Inn’s history and the region’s renowned architectural style. 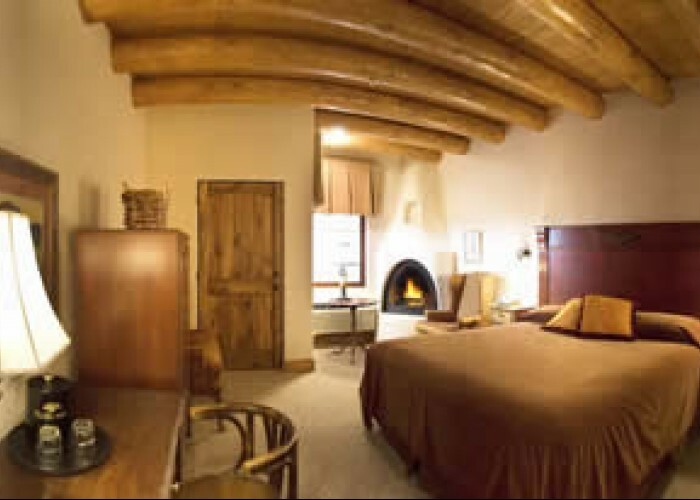 Among the distinctive details are rough-hewn viga ceilings, antique furnishings and decorative kiva fireplaces. 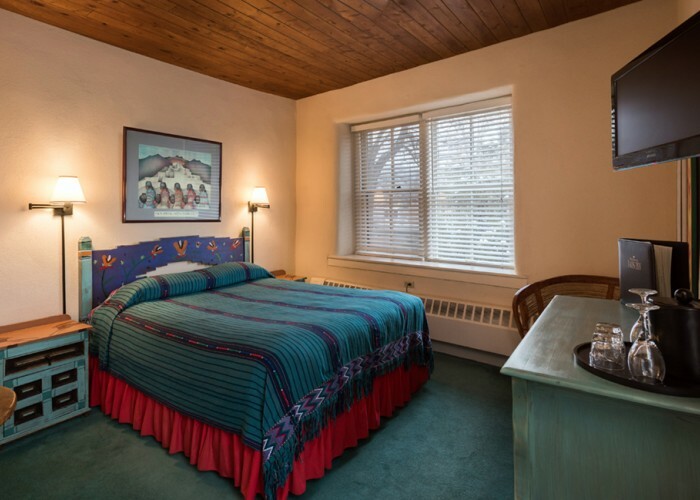 Click in the map below to see our rooms. 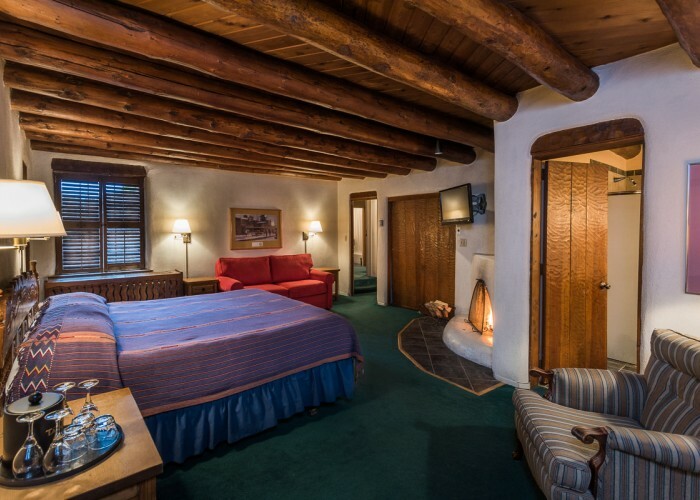 Large corner room on ground floor of main building with two queen beds, beautiful decorative corner fireplace(non-functional), viga ceiling , separate step-down dressing area with hand-painted, full-length mirror (by Taos artist, Jim Wagner), a table and chairs, and air conditioning. Makes a great family room. 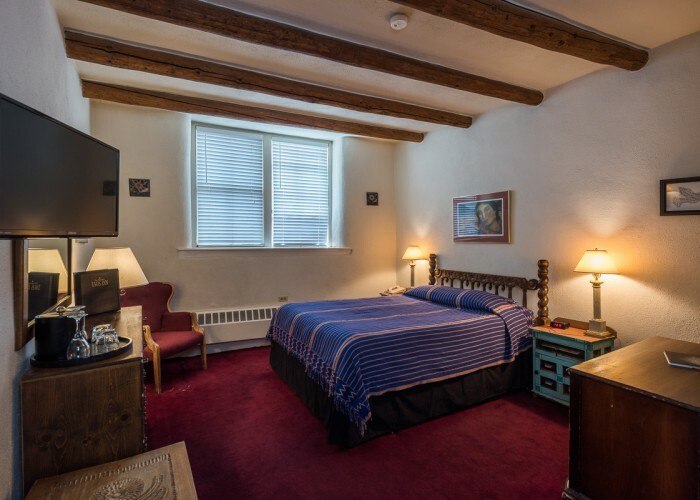 A cozy queen bedded room on the ground floor of main building. 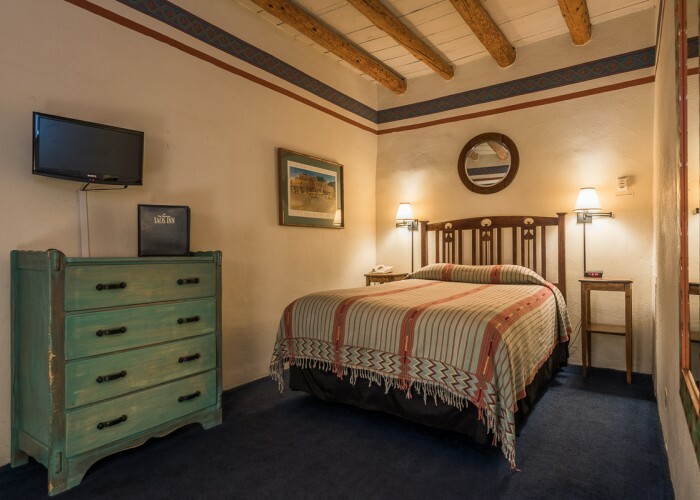 Features a hand carved headboard, hand-painted side tables, wood dresser with matching mirror, viga ceiling, writing desk, sofa chair, decorative pueblo-style fireplace(non-functional) and air conditioning (can connect with room 103). 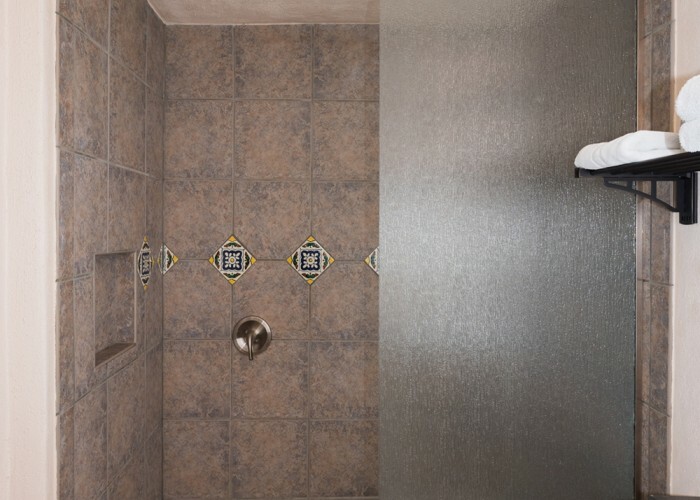 Two bedroom suite off patio. 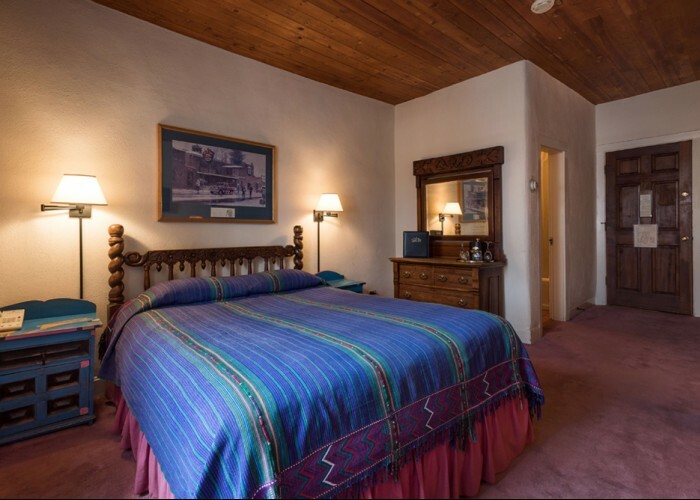 Main bedroom has king-size bed, sofa, with corner wood burning fireplace,luxurious bathroom with his and her sinks, and a double headed walk-in shower with glass partition etched with our famous thunderbird. 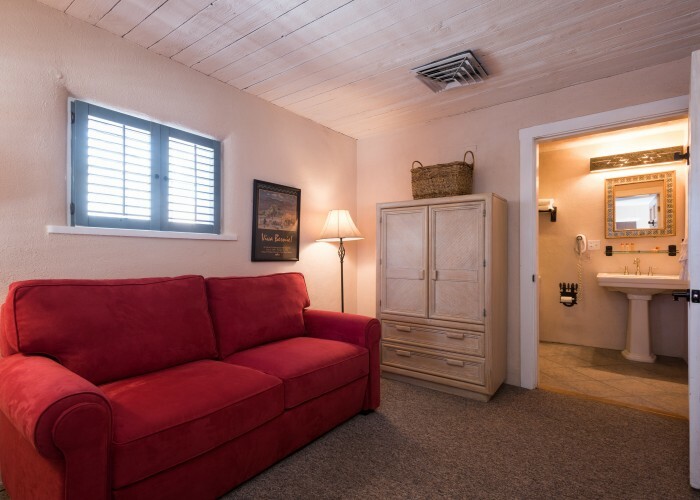 The main room also has a viga ceiling, writing desk with chair, recliner, and evaporative cooling. 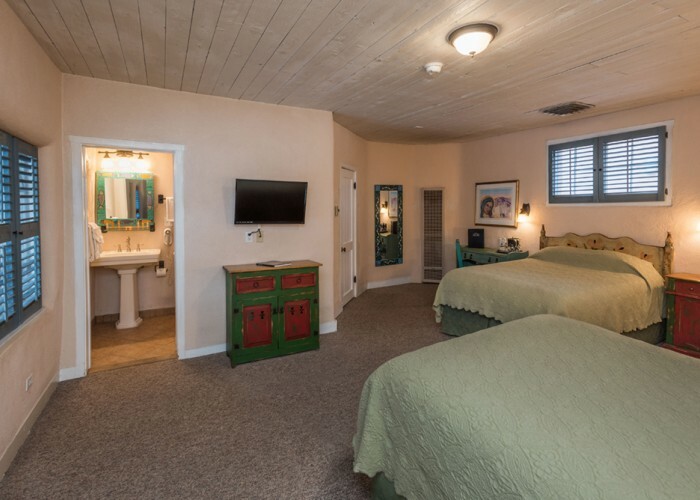 The second room has two built-in twin banco beds, love seat, refrigerator with bar sink, second bathroom, television, This room also has convenient access to hotel lobby. It is a perfect family room. 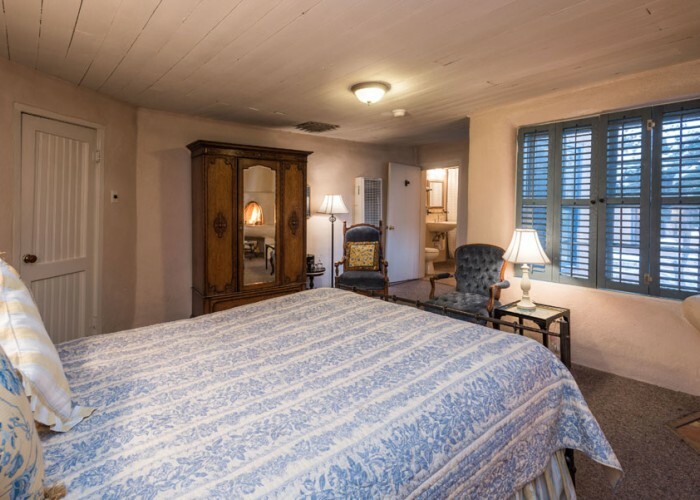 Spacious early american style room with a king bed, matching wing back chairs, an antique armoire, a separate dressing area adjacent to bathroom, a hand painted mirror, a large closet with beautifully hand carved door, a wood-burning fireplace, and evaporative cooling. 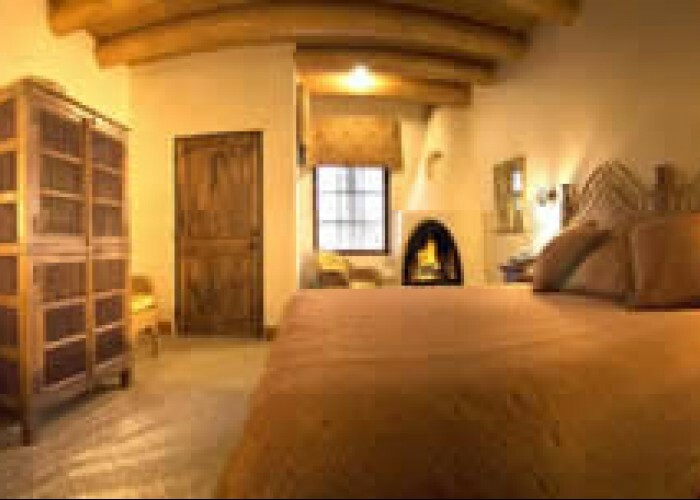 Charming smaller room off the patio features queen bed with unique hand painted headboard, wood-burning pueblo-style fireplace, spacious dressing area adjacent to bathroom, antique armoire, evaporative cooling. 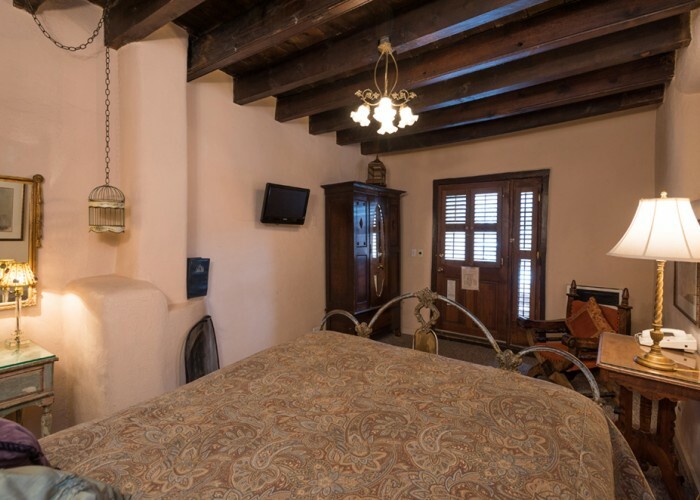 Private corner off-patio room with queen sized iron canopy bed, end tables, flat screen television, wing back sofa chair, antique armoire, elevated pueblo-style wood-burning fire place, painted old wood ceiling, and evaporative cooling. 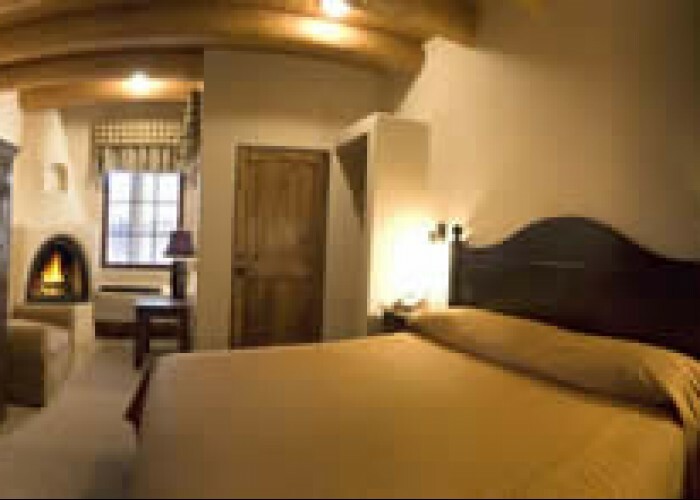 One of our Courtyard Suites. 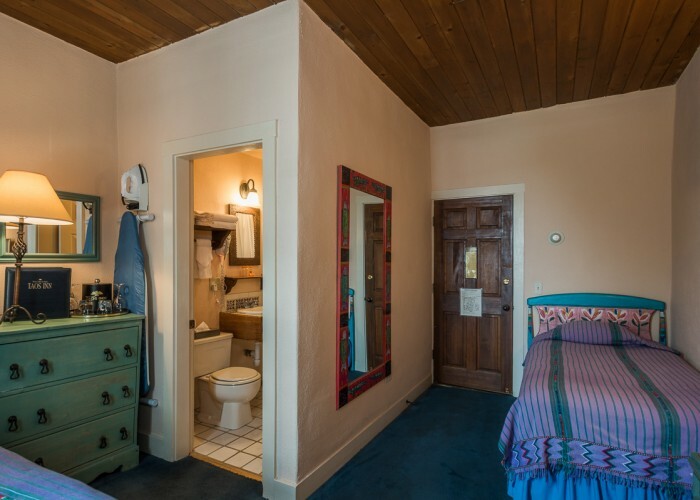 Two adjoining rooms, each with separate bathroom, and evaporative cooling. 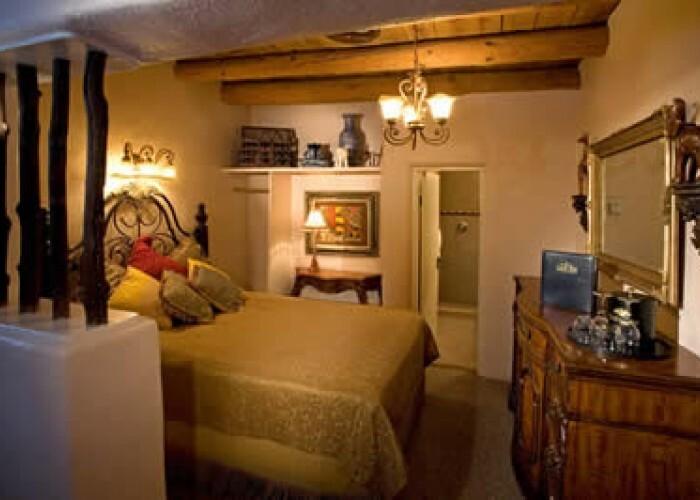 Bedroom features queen bed with charming built in headboard, wall sconces and nichos, bancos around a seasonal wood burning fireplace, flat screen TV, wicker chest of drawers and armoire, and a Mexican leather chair. 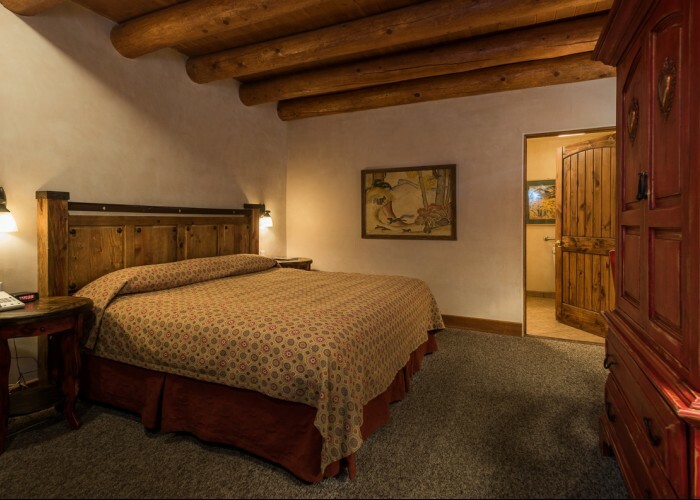 This particularly spacious room has a king bed and a Taos Day Bed that converts to a comfy bed suitable for children. Banco seating around a wood burning fireplace, writing desk and chair, lounge chair, old board ceiling and evaporative cooling. 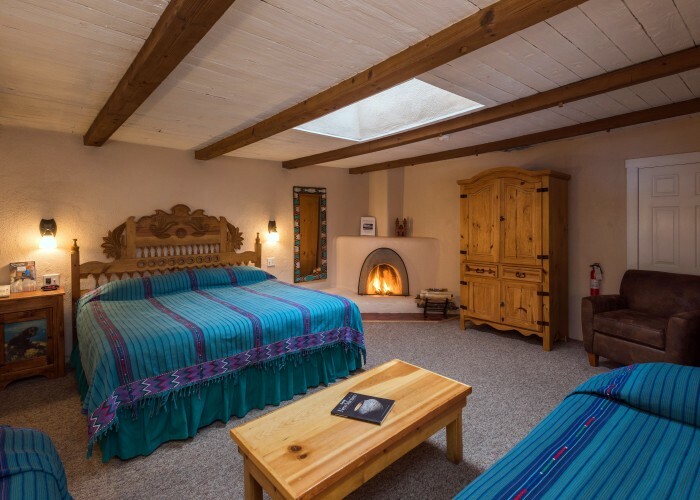 Wonderful large room features a king bed with a hand-carved headboard, wood burning adobe fireplace with seating bancos, hand-painted trastero and mirror, table and chairs, old board ceiling and evaporative cooling. 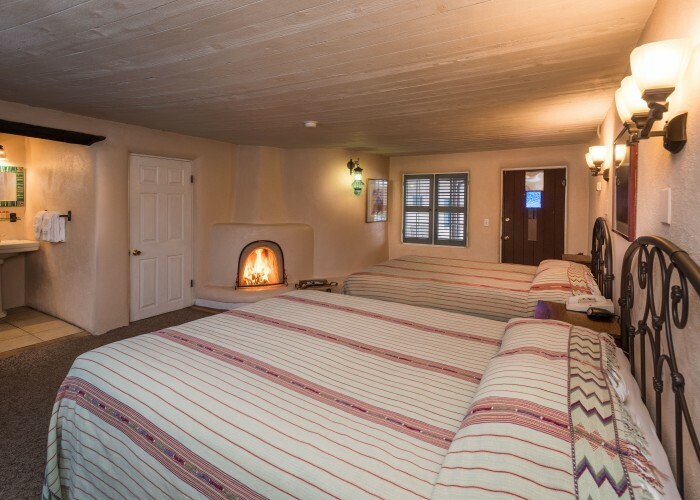 One of our quietest rooms, this cozy room located in the back of the courtyard has a queen bed, seasonal wood burning elevated fireplace, hand painted details on the walls and fireplace, a hand painted cabinet and mirror, wicker and leather chairs, and evaporative cooling. 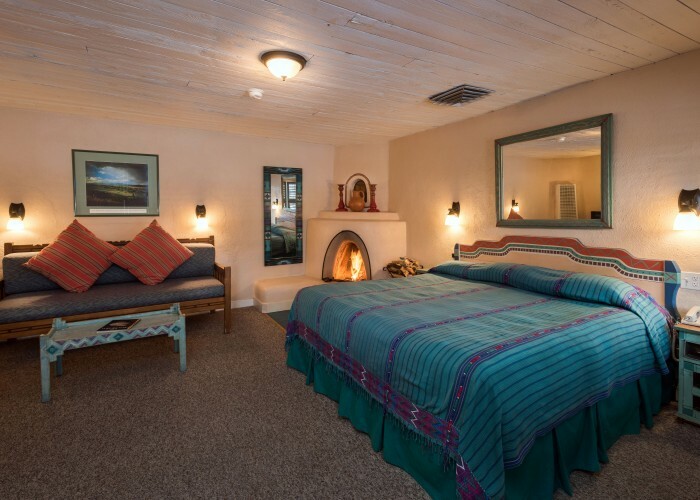 Queen bed with hand-carved headboard in half alcove, matching love seat and dresser, hand-painted mirror, seasonal wood burning fireplace, comfortable chair, old board ceiling and evaporative cooling. 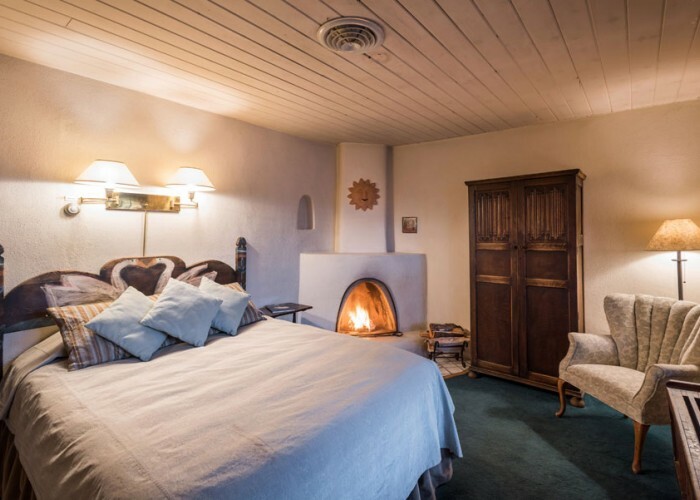 Quiet room in the back of the courtyard, queen bed in cozy half-alcove, hand painted love-seat facing seasonal wood burning corner fireplace with banco, writing desk, hand-painted mirror, old board ceiling and evaporative cooling. 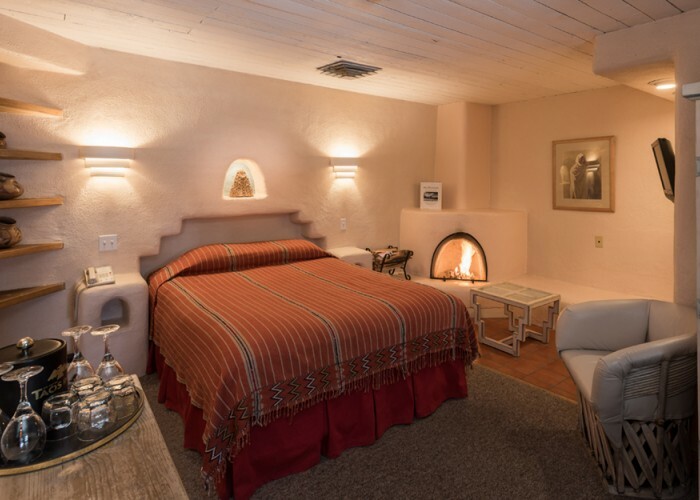 This particularly charming room has two queen beds with Mexican hand-carved headboards, seasonal wood burning fireplace with long, curved banco, sofa chair, dresser, writing table, old board ceiling and evaporative cooling. 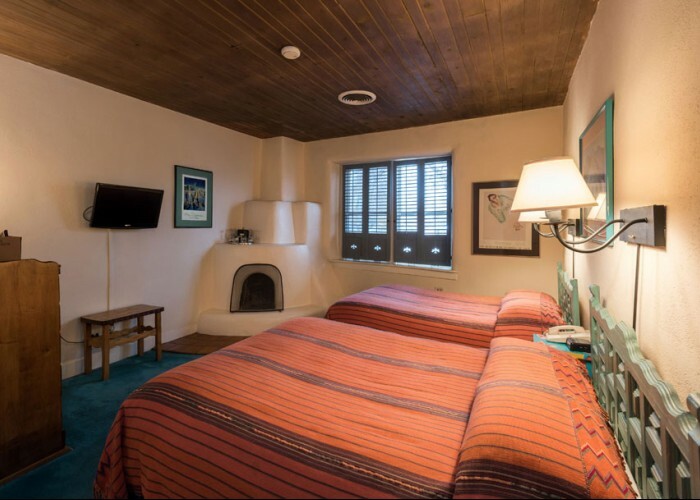 Tucked away in the corner of the courtyard, this spacious room has two double beds with beautiful hand painted headboard, a cozy banco sitting/sleeping area suitable for one small child, seasonal wood burning fireplace in tiled area, table and chairs, and evaporative cooling. 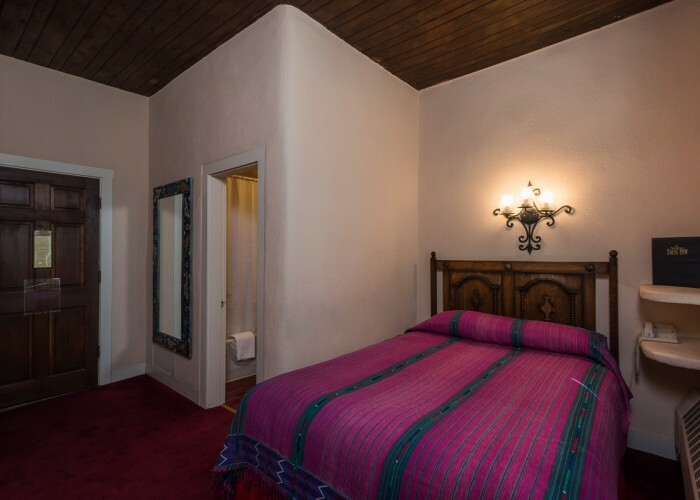 Spacious and bright room with two full sized beds with hand carved Mexican headboards. 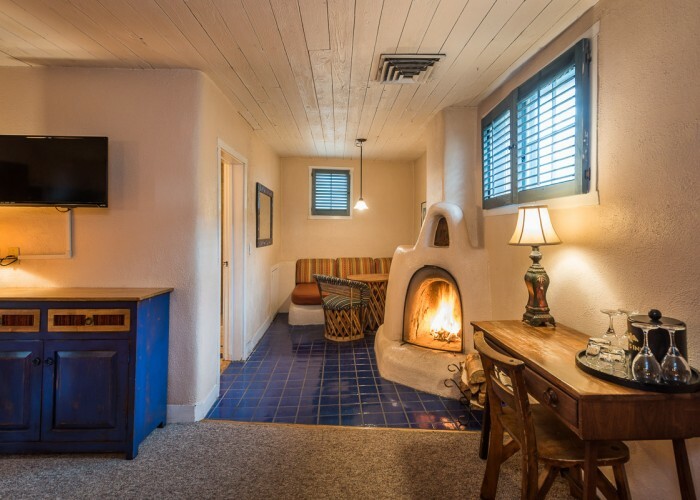 Seasonal wood burning corner fireplace in tiled area with bancos, dresser, love seat, sofa chair, old board ceiling and evaporative cooling. 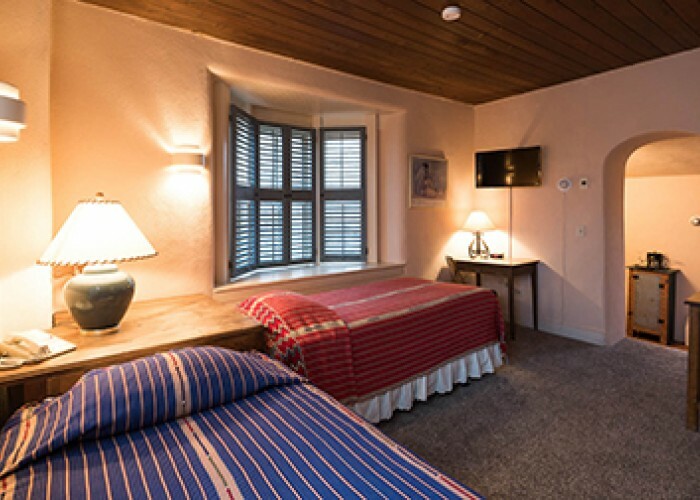 Spacious Courtyard room. 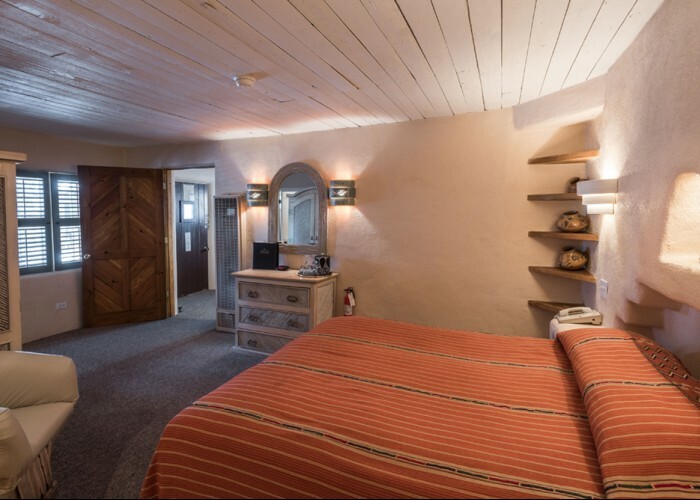 Two full size beds with hand painted headboards, bancos around the seasonal wood burning adobe fireplace, table and chairs, a writing desk and evaporative cooling. 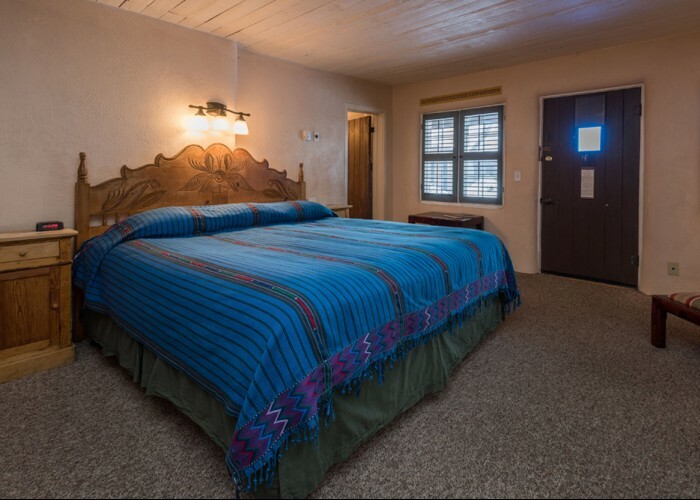 Spacious, sunny room has a king bed with wood headboard and a queen sofa-bed, large wood burning adobe fireplace(seasonal) with banco seating, writing desk, hand painted details on walls, old board ceiling and evaporative cooling. 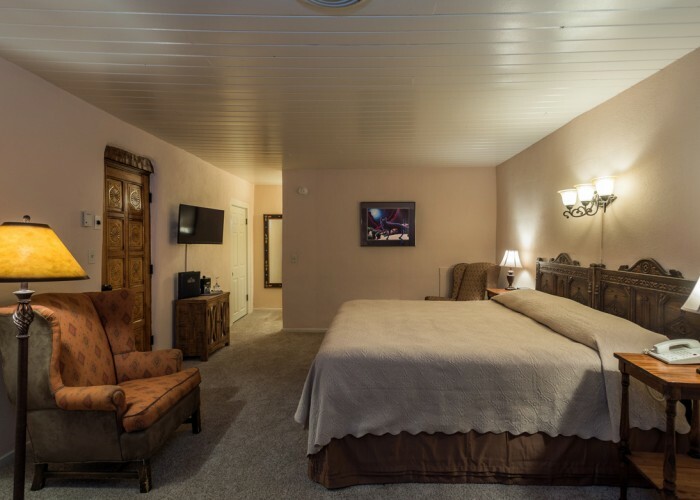 One of our Courtyard Suites. 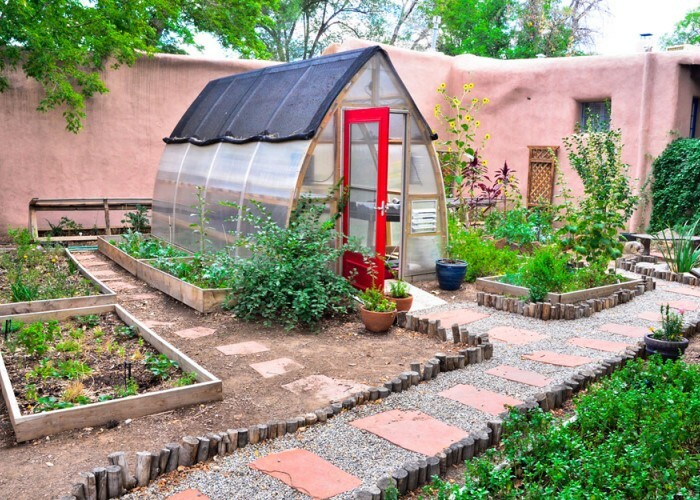 Two rooms - each with its own bath, television, telephone and evaporative cooling. 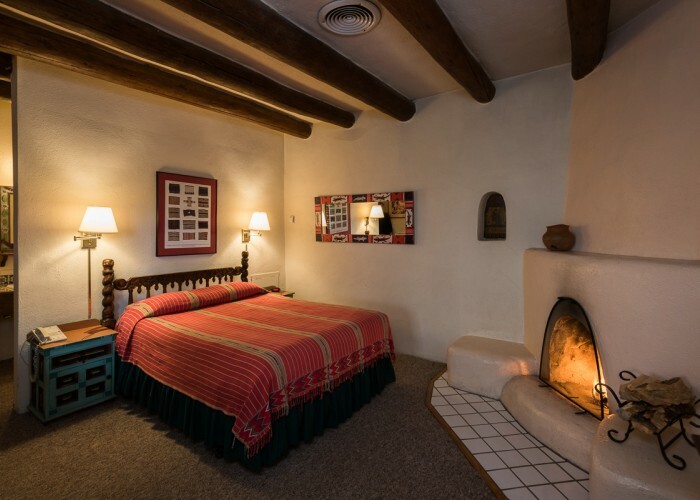 The larger room features a king-sized bed, two sofa chairs, decorative hand painted border on the wall and pueblo style fireplace, and a writing desk. 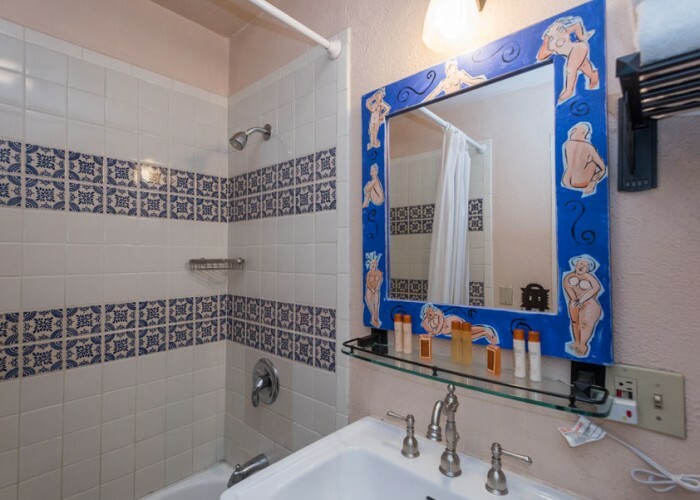 A Helen Martin's batik giclee reproduction entitled "Taos Fiesta" graces the wall, along with a hand painted mirror and a natural mixed media collage piece by Taos artist Deb Villalobos. 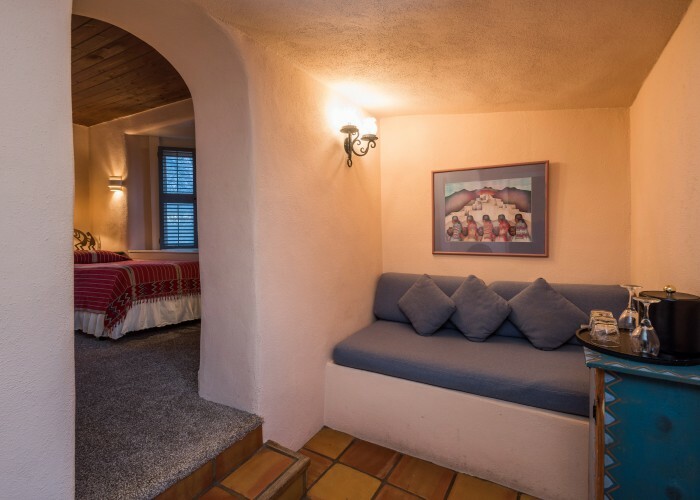 The smaller sitting room has a sofa with a hand painted mexican wood trastero and a flat screen television. 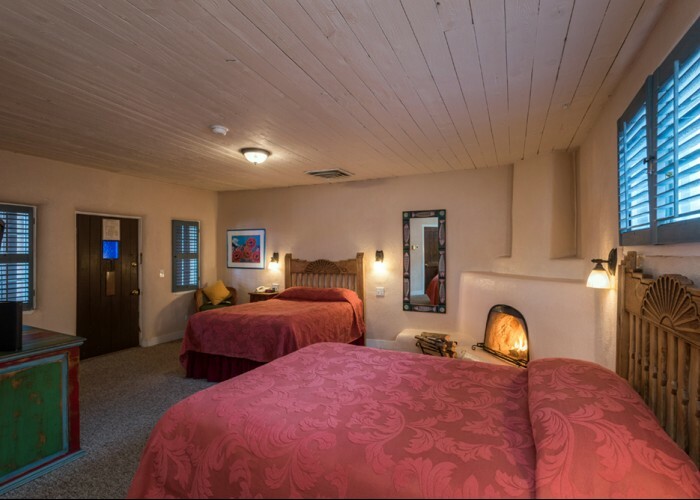 Large, sunny corner room upstairs in main building has a king-sized bed with hand-carved headboard, antique dresser, wood ceiling, comfortable chair, hand painted mirror, night stands, decorative hand painted pueblo-style fire place (non-functional), with large banco seating area, and evaporative cooling. 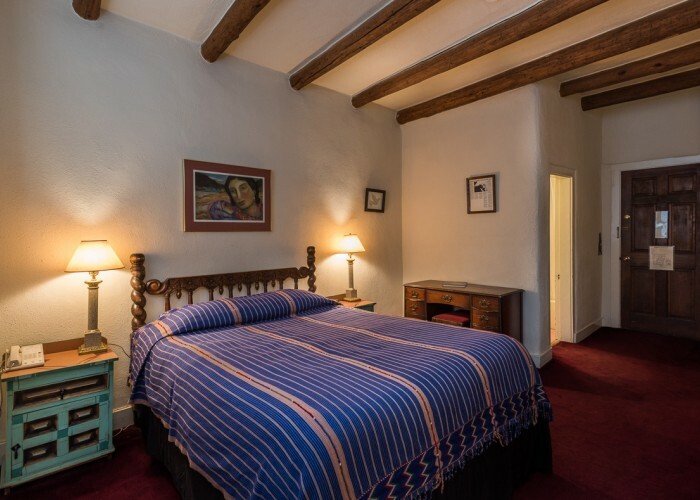 Spacious second floor room in main building features two double beds, Guatemalan bedspreads, hand-painted mirror, decorative pueblo-style fireplace (non-functional) in tiled area, paneled ceiling, and evaporative cooling. 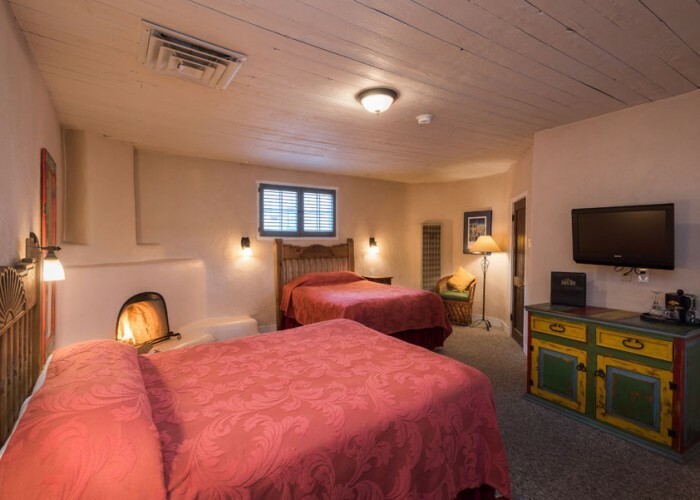 Large upstairs room in main building, queen bed plus Taos day bed (which doubles as a couch and sleeper), hand-painted mirror, decorative, non-functional, corner fireplace, antique dresser, paneled ceiling, table and chairs, evaporative cooling. 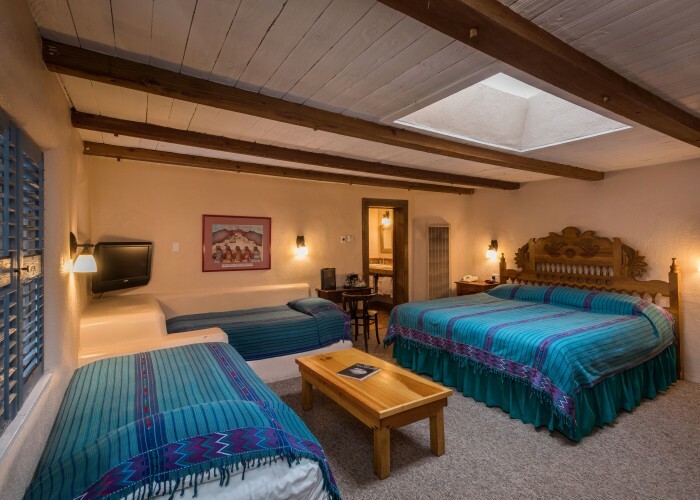 Large, sunny corner room upstairs in the main building faces Truchas Peaks to the south and overlooks the adobe village of Taos. 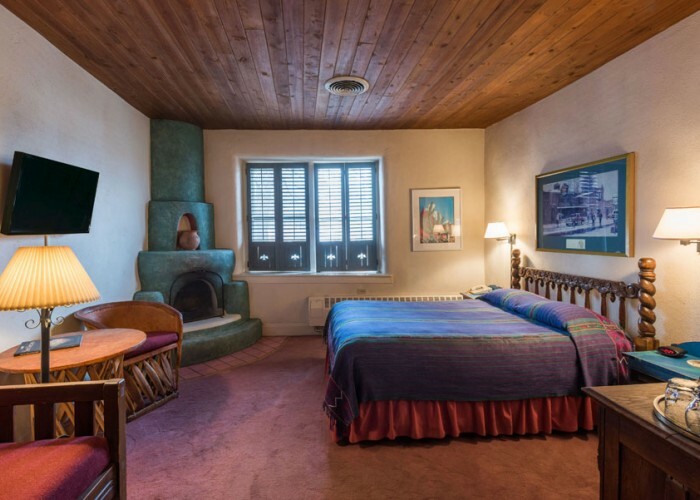 Decorative, non-functional, corner fireplace with seating area, queen size bed, antique dresser, full-length mirror (hand painted by Taos artist, Jim Wagner,) paneled ceiling, table and chairs, evaporative cooling. 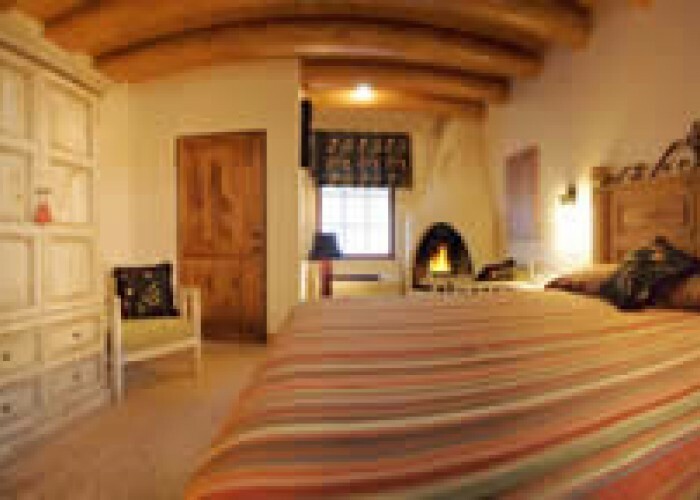 Cozy, small room overlooking the rooftops of the village of Taos and mountains to the southeast. 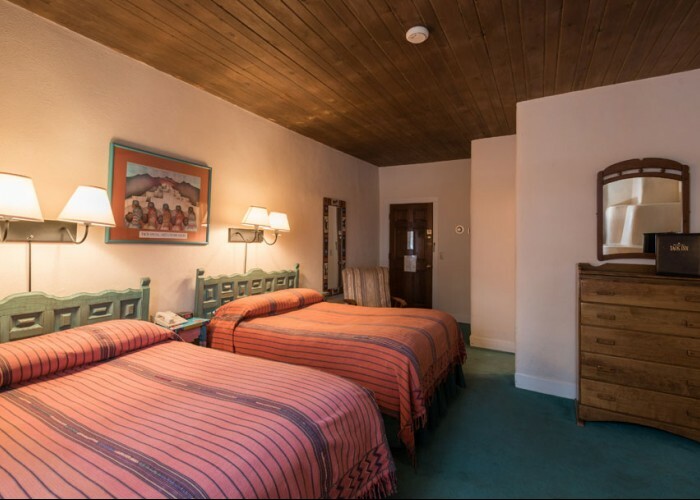 Double bed, paneled ceiling, easy chair, evaporative cooling. 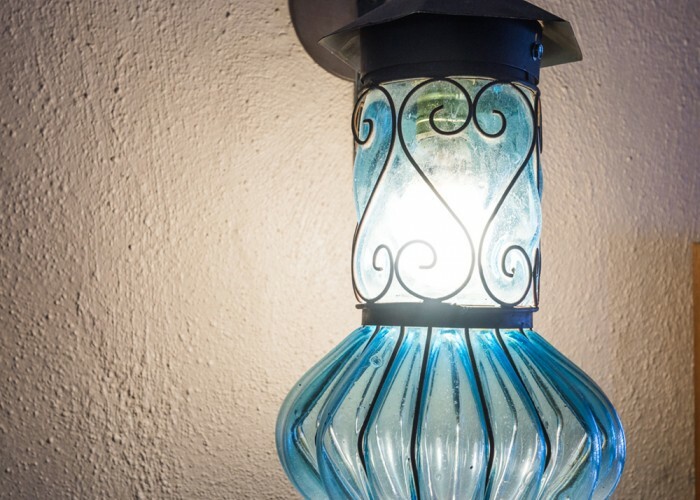 Doorstep opens onto balcony overlooking the lobby of the Inn and the Adobe Bar, a local's favorite gathering place that features live music nightly from 7:00-10:00 p.m. 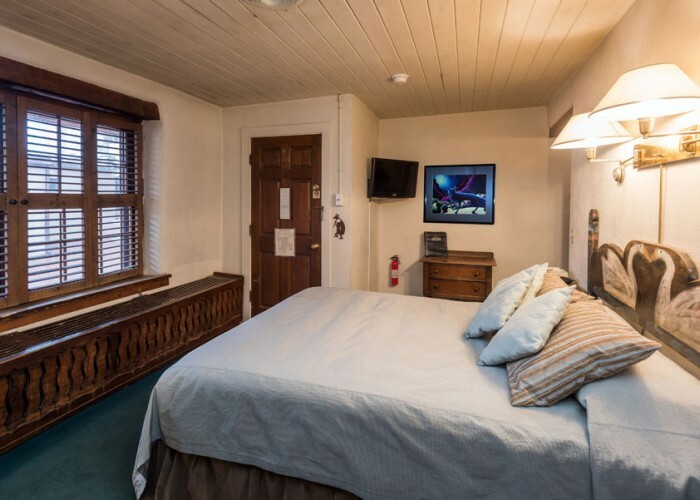 Perfect for the adventuresome and music lover; may not be appropriate for romance or early to bedders. 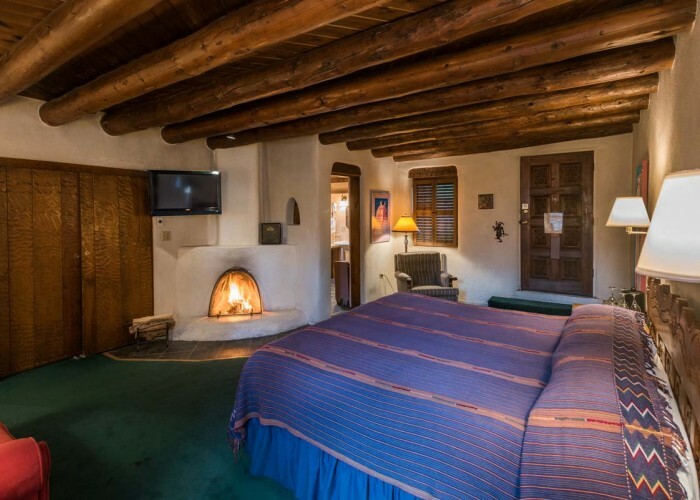 Cozy, small room off the balcony, double bed, view of rooftops of the adobe village of Taos, paneled ceiling, evaporative cooling. 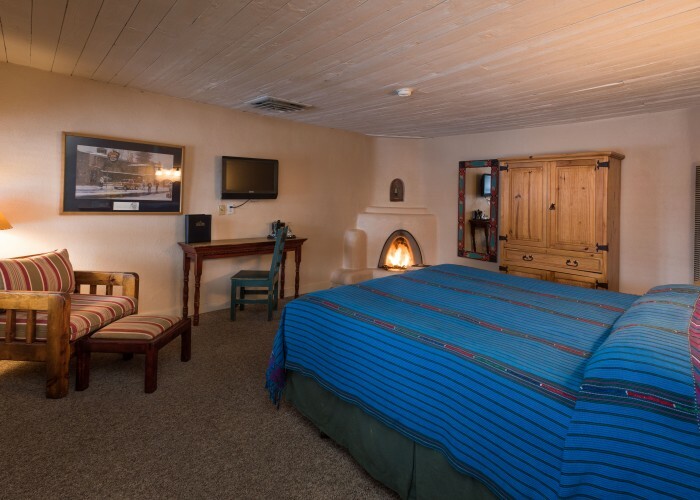 Doorstep opens onto balcony overlooking the lobby of the Inn and the Adobe Bar, a local's favorite gathering place that features live music nightly from 7:00-10:00 p.m. 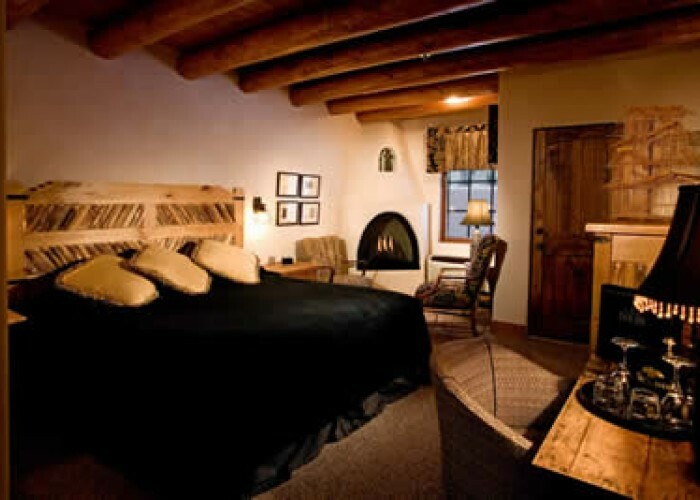 Perfect for the adventuresome and music lover; may not be appropriate for romance or early to bedders. 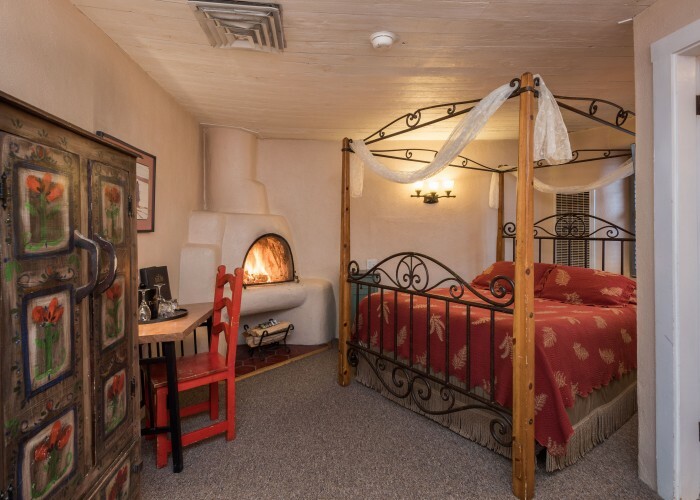 Cozy, small room off balcony above lobby, two twin beds sitting head to head with view of the adobe village of Taos, antique armoire, hand-painted mirror, paneled ceiling, and evaporative cooling. 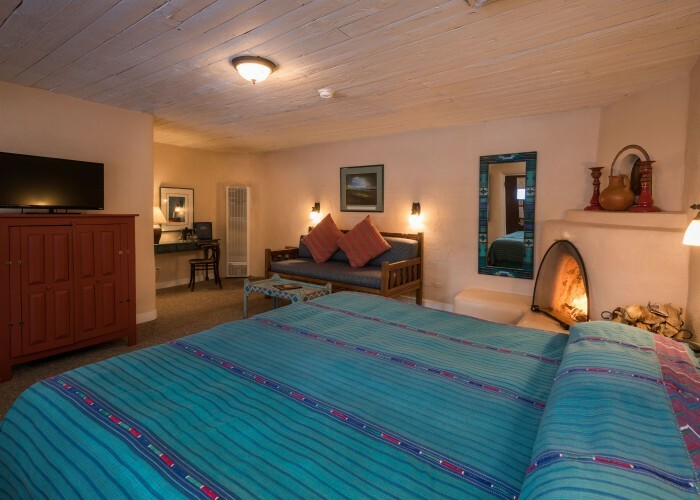 Doorstep opens onto balcony overlooking the lobby of the Inn and the Adobe Bar, a local's favorite gathering place that features live music nightly from 7:00-10:00 p.m. 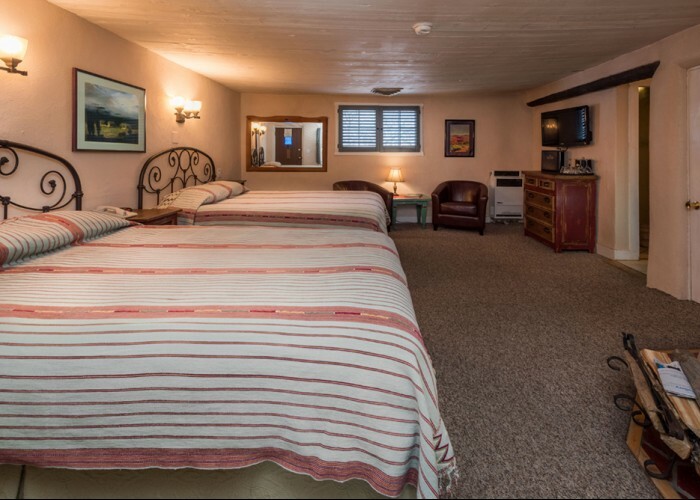 Perfect for the adventuresome and music lover; may not be appropriate for romance or early to bedders. 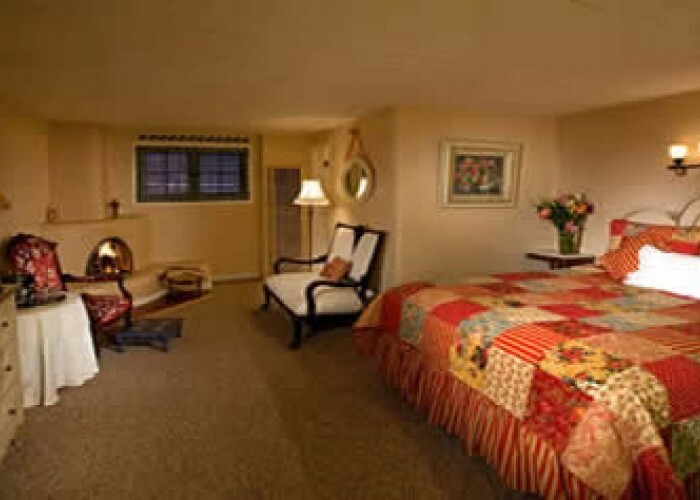 Cozy, small room off balcony that overlooks lobby. 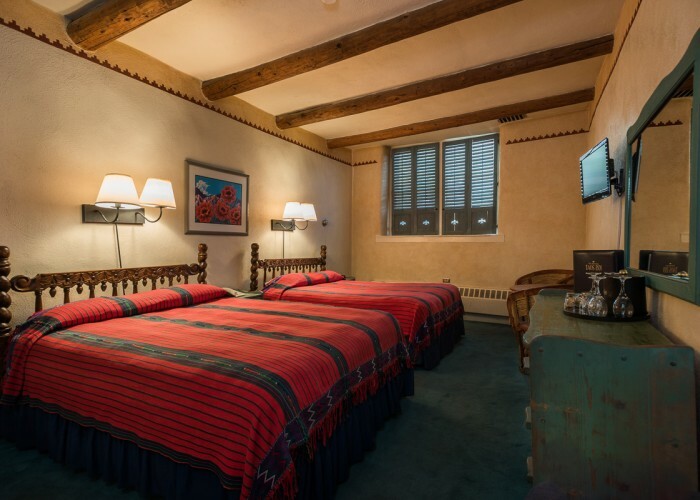 Double bed, antique dresser, southwest view of adobe village of Taos, paneled ceiling, evaporative cooling. 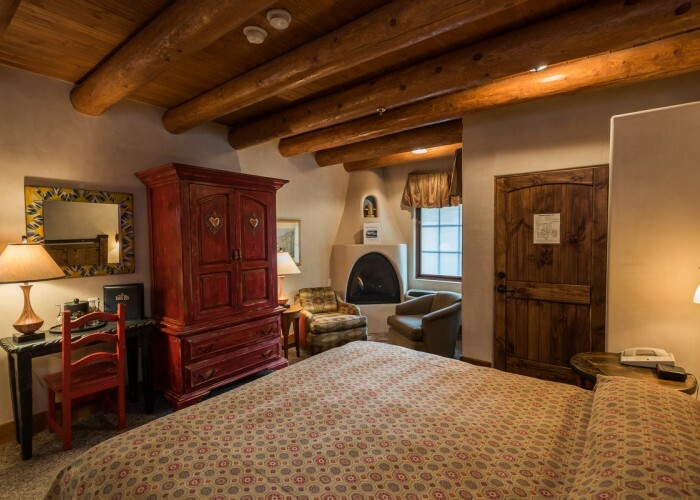 Doorstep opens onto balcony overlooking the lobby of the Inn and the Adobe Bar, a local's favorite gathering place that features live music nightly from 7:00-10:00 p.m. Perfect for the adventuresome and music lover; may not be appropriate for romance or early to bedders. 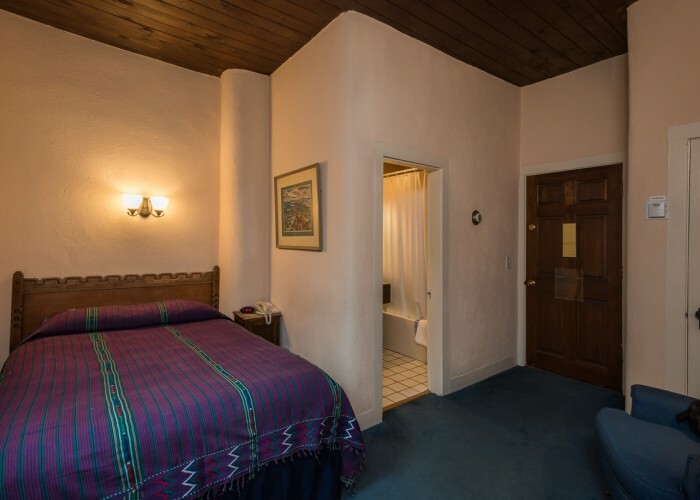 Charming room tucked away in the corner of the balcony, very private with anteroom containing a decorative fireplace (nonfunctional) and banco. 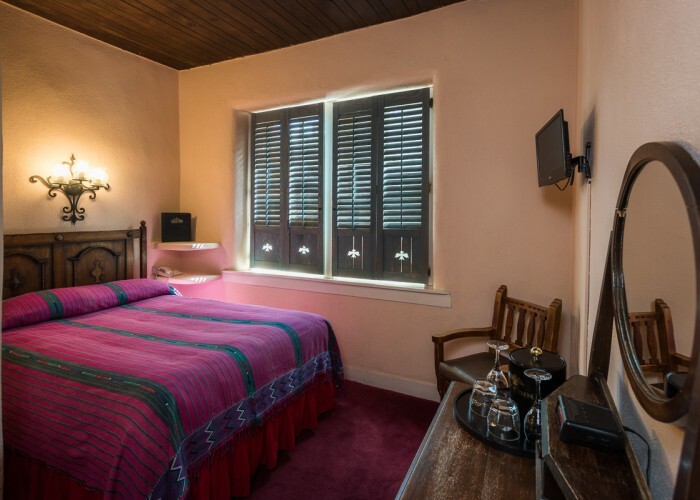 Back room overlooks front courtyard and our famous neon sign. 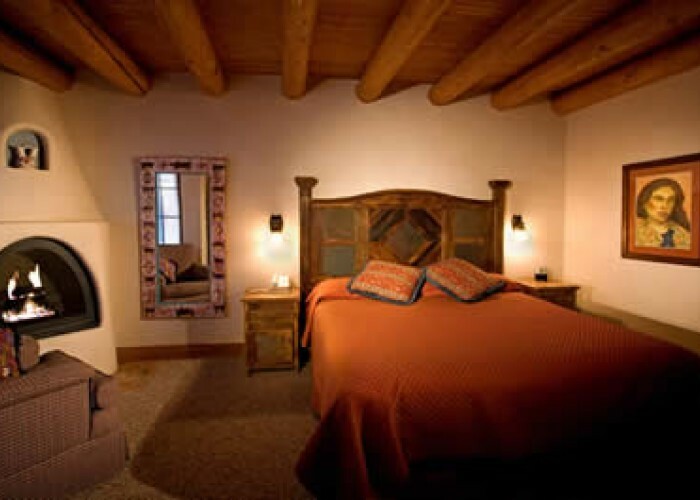 Bedroom has two twin beds, beautiful bay window overlooking the adobe village of Taos. Our only room on the front of the building; road noise is a consideration. Antique dresser and armoire, writing desk, hand-painted dresser and evaporative cooling. 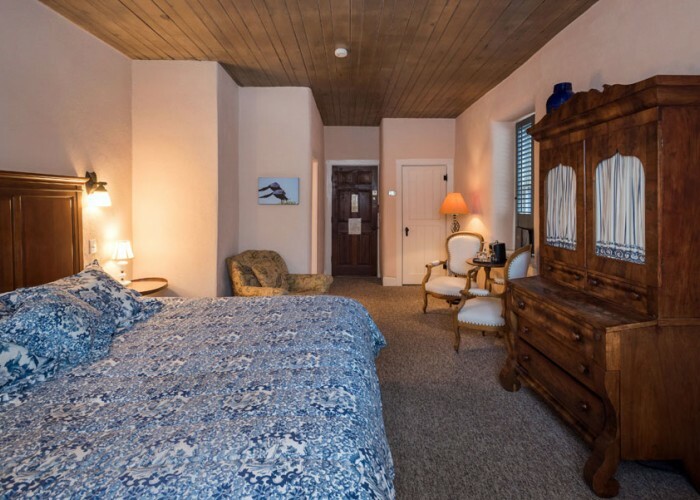 A truly unique room, perfect for people watching! 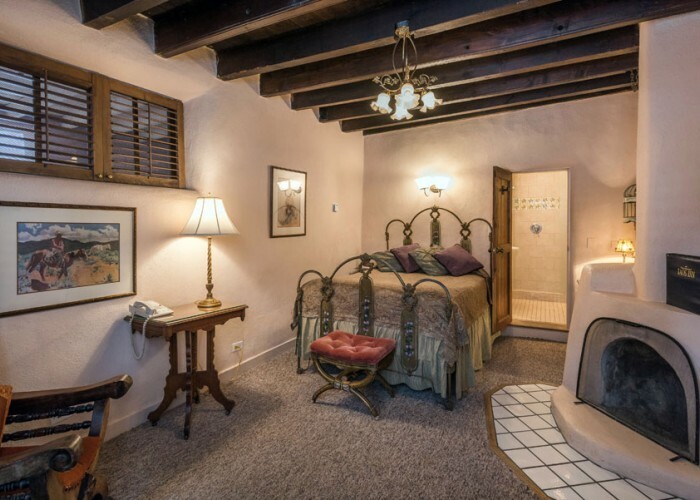 Small, cozy room with antique double bed, decorative fireplace (non-functional), antique armoire, table and chairs, paneled ceiling, hand-painted mirror and evaporative cooling. 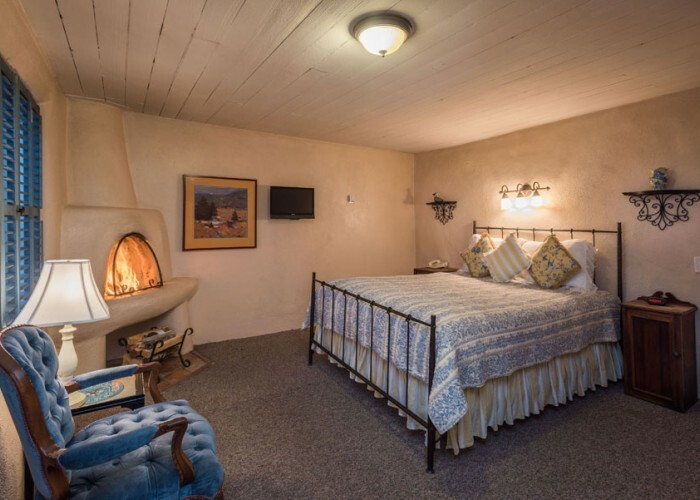 Lovely, homey room with queen bed, seasonal wood-burning fireplace with seating bancos, antique dresser, viga ceiling, small dressing area next to bathroom, table and chairs, hand-painted mirror and evaporative cooling. 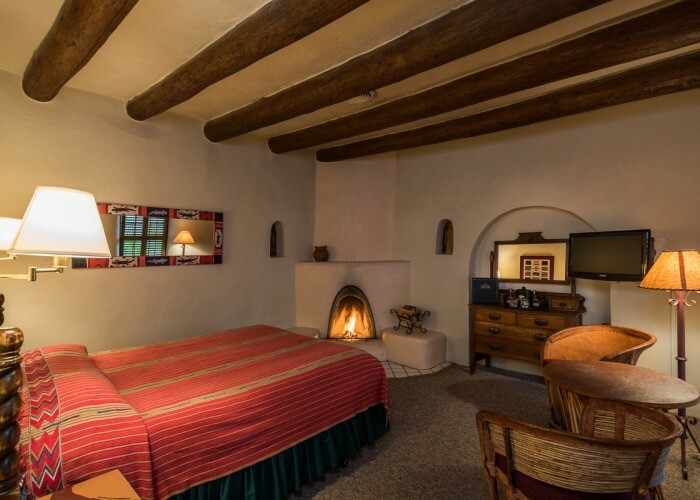 Spacious room with queen bed, large bathroom, seasonal wood-burning adobe fireplace, mirror painted by Taos artist, Jim Wagner, writing desk and chair, antique dresser and night stands, flat screen television, love seat, closet and evaporative cooling. 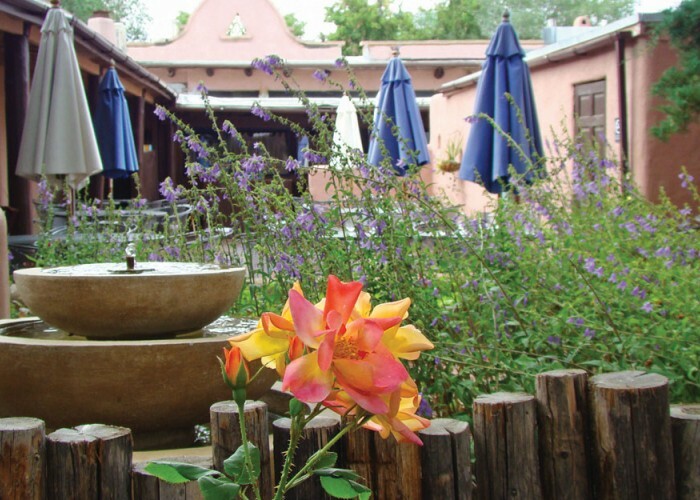 The perfect taste of Taos. 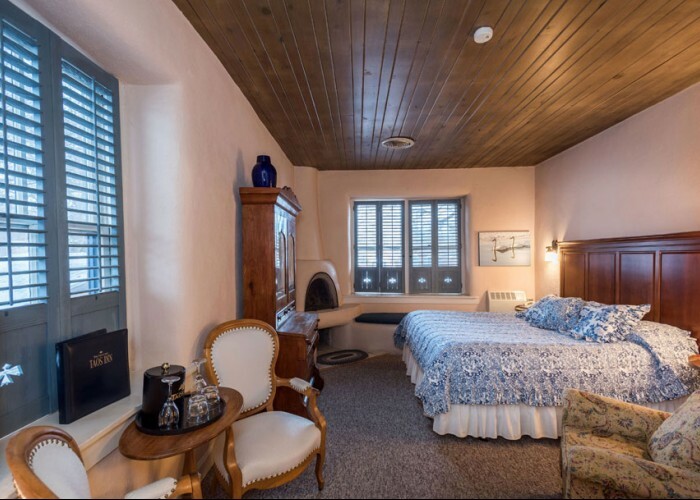 Romantic king-sized bedroom with wood burning fireplace, antique armoire, hand-painted chair, hand-carved dresser, viga ceiling and evaporative cooling. 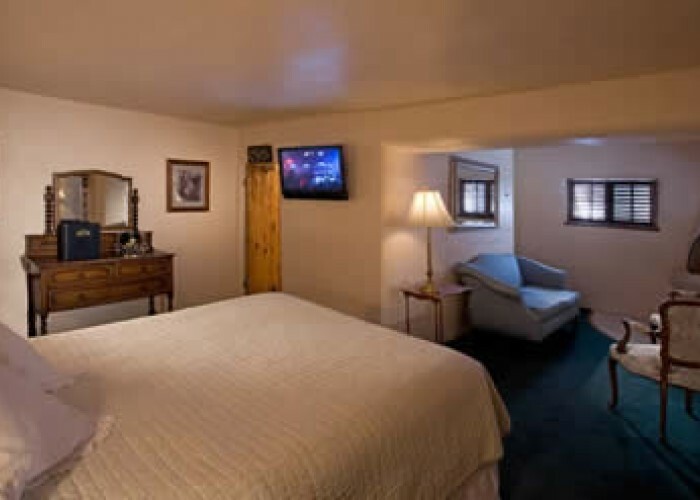 Separate sitting room with a double twin day bed suitable for smaller adults or children, writing desk, and second TV and phone - a mini king suite. 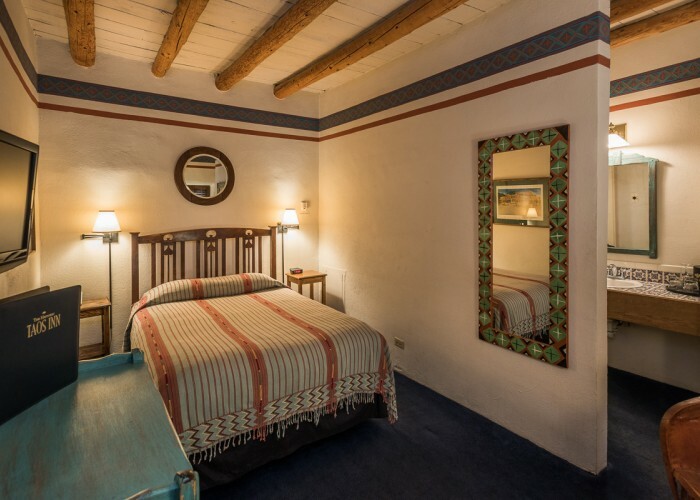 Cozy, smaller room with antique double bed, hand-painted mirror, old board ceiling with vigas, small dressing area off bathroom, evaporative cooling. 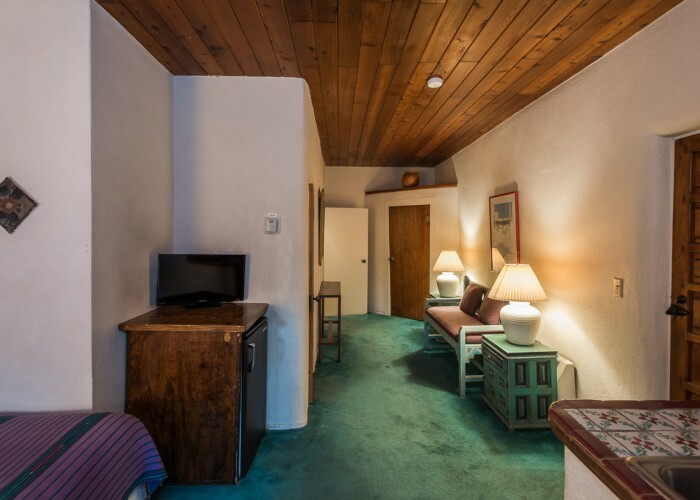 No fireplace. 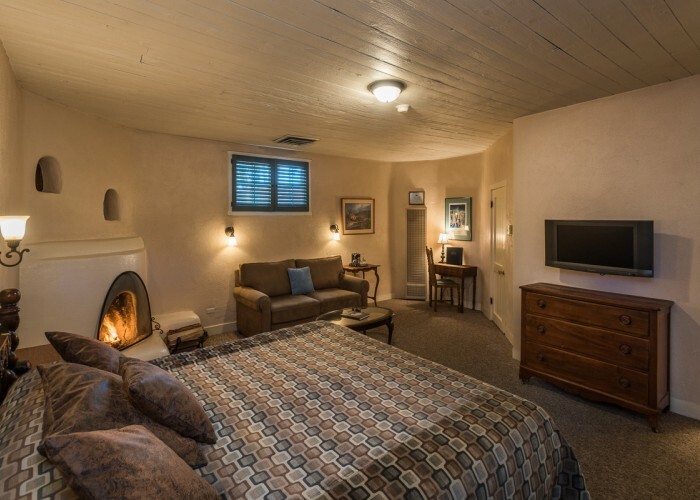 Separate sitting area with wood burning fireplace, tile floor, chaise longue, Queen Anne chair with an Ottoman, and a flat screen television. 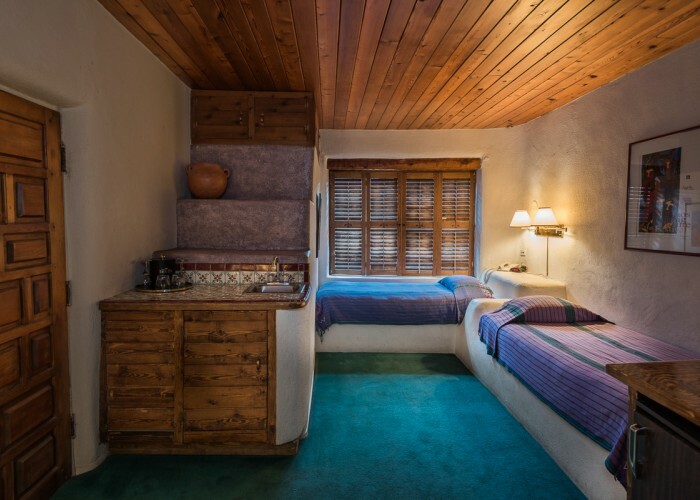 Step-down, recessed sleeping area with regal queen bed, ceiling with vigas, dresser, desk, and evaporative cooling. 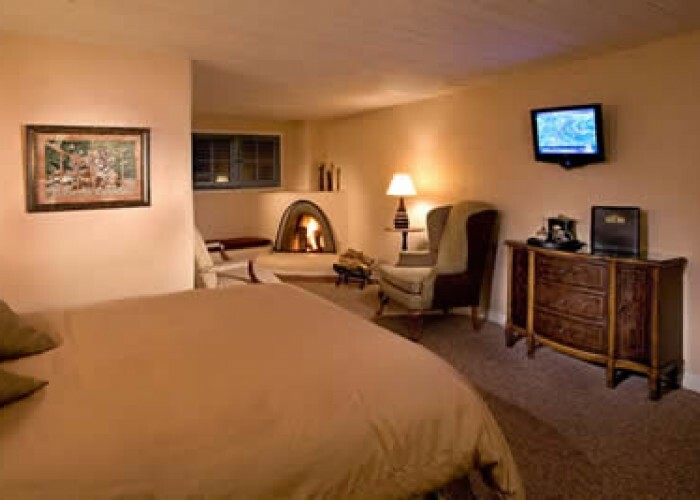 Perfect for couples on a romantic getaway. 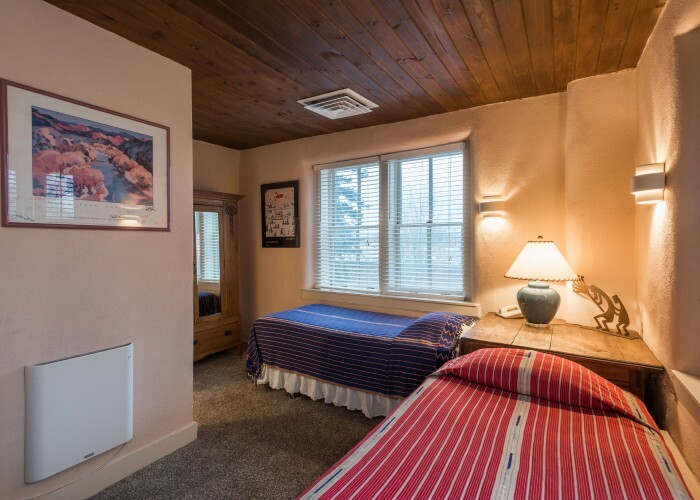 Quiet corner room across from Sandoval House and close to parking. 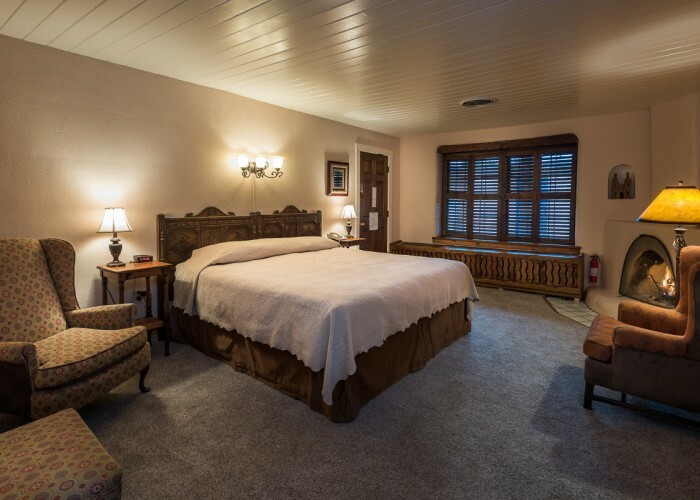 Beautiful dark wood headboard, accompanied by matching end tables, carved antique armoire, two plush beige sofa chairs, and a gas fireplace. 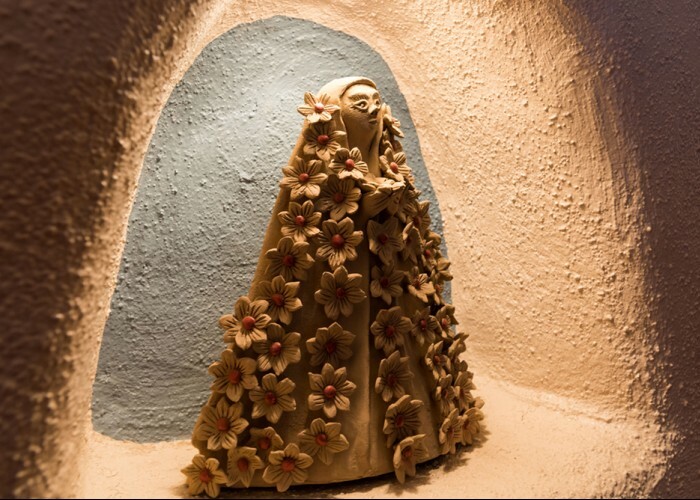 Features artwork of Taos natives Miguel Martinez and Deborah Villalobos. 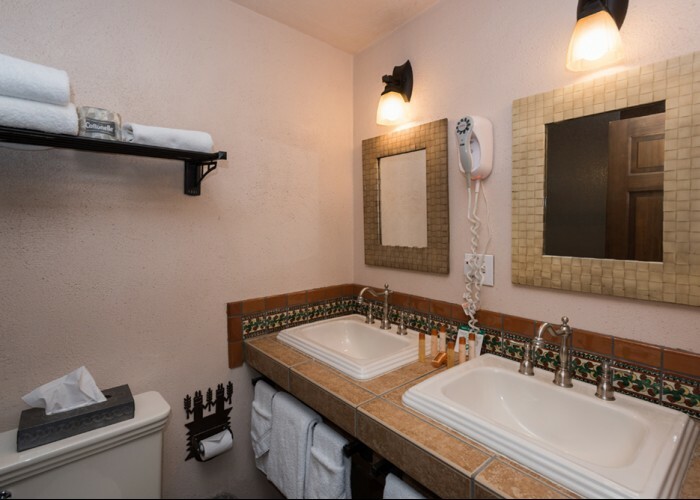 ADA amenities. 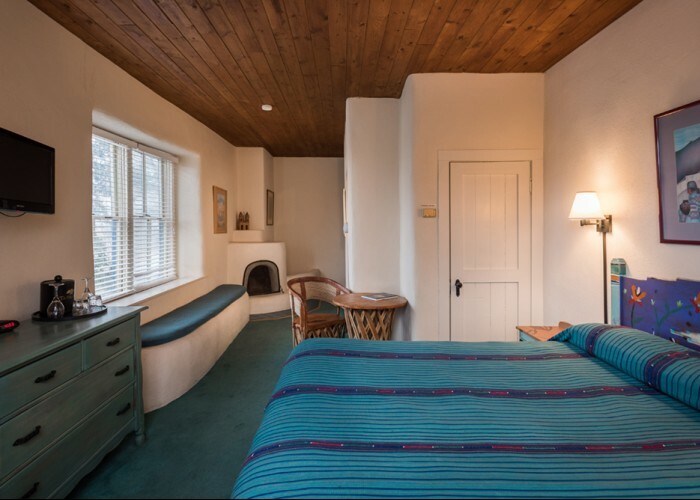 This is a lovely room with shared courtyard between Sandoval House. Furnishings and fabrics inspired by the rooms centerpiece, a giclee reproduction of Helen Martin's batik "Spanish Dancer". 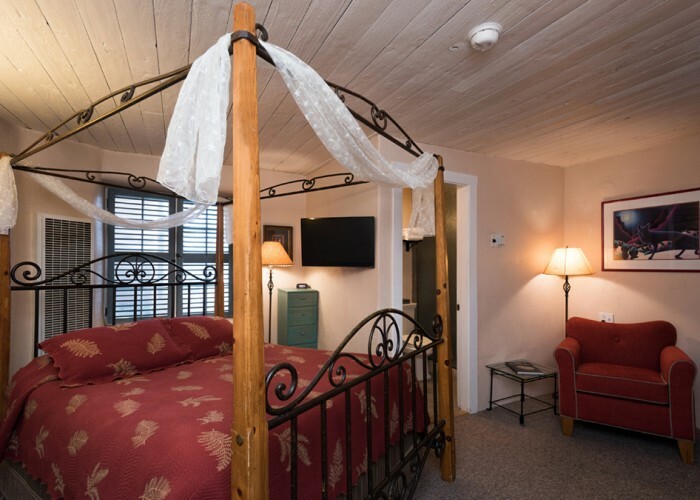 Wicker headboard with matching wicker chairs and armoire. Comforter is hand made, deep red with intricate gold pearl needlework. 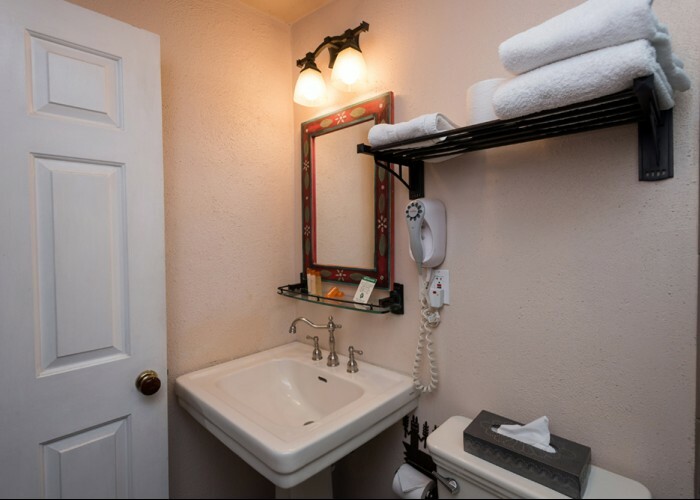 Also has a nice writing desk with a chair, with an antique mirror and a gas fireplace. 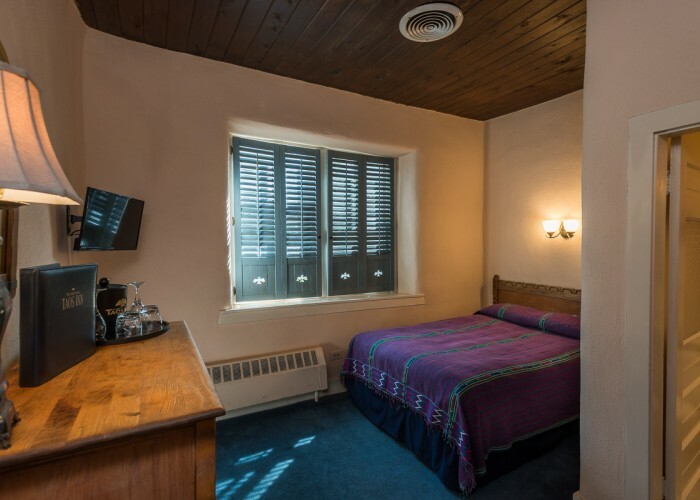 This is a very elegant room, with a beautiful antique ebony headboard, hand carved armoire and desk with matching chair. 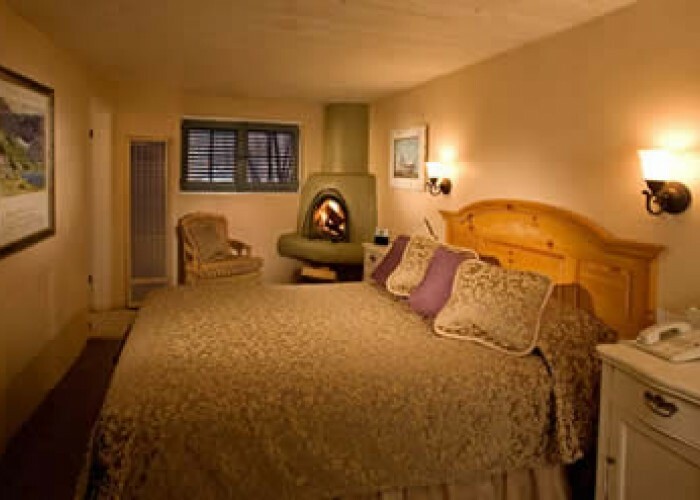 There is also a set of wing back chairs and a gas fireplace. 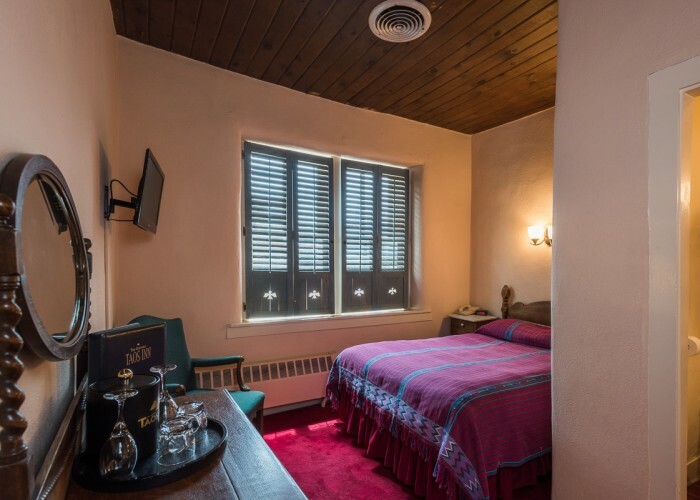 Room has a regal redwood stained headboard, with Early America style furnishings, including an armoire, end tables, and set or wingback chairs. 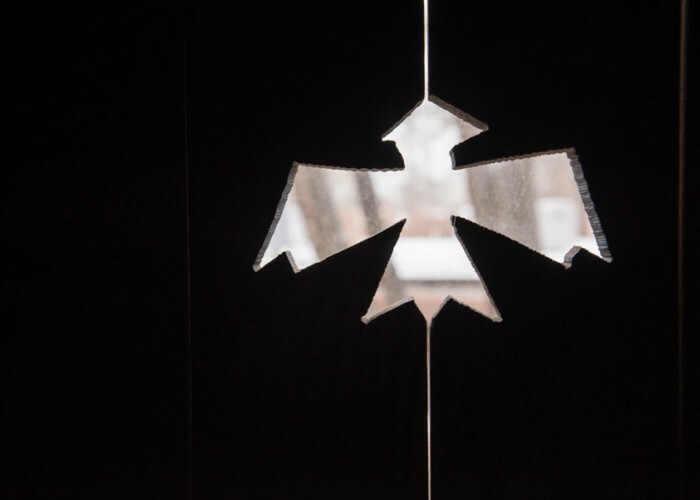 Walls feature the art of Miguel Martinez and Helen Martin's "Juanito". 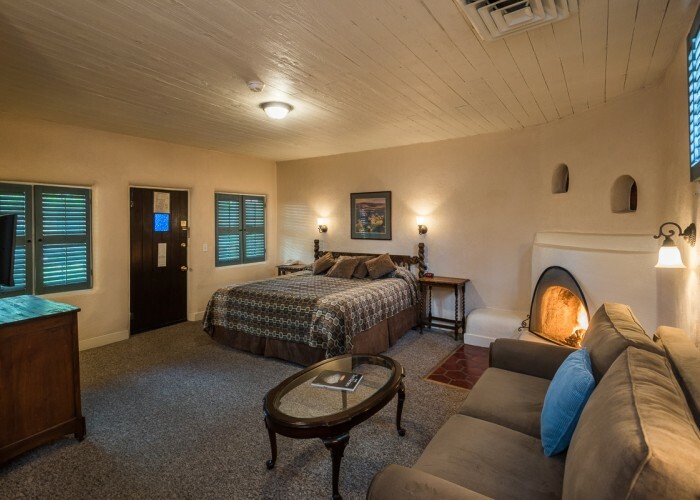 This room also has full length mirror and gas fireplace. 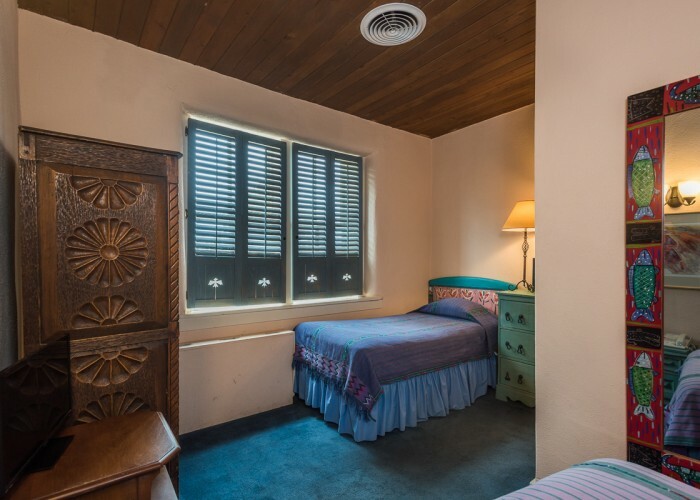 Gorgeous room with oak hand carved knotty headboard with cast iron fleur de lis, and a colorful hand sewn bed spread with matching window curtains. There is a grand white antique armoire, paired end tables, hand painted full sized turtle mirror, sofa chairs and gas fireplace. 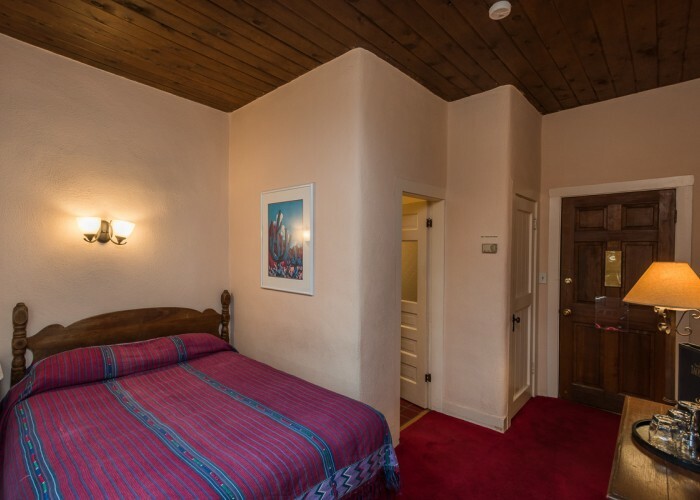 Features giclee reproduction of Helen Martins batik of Kit Carson. 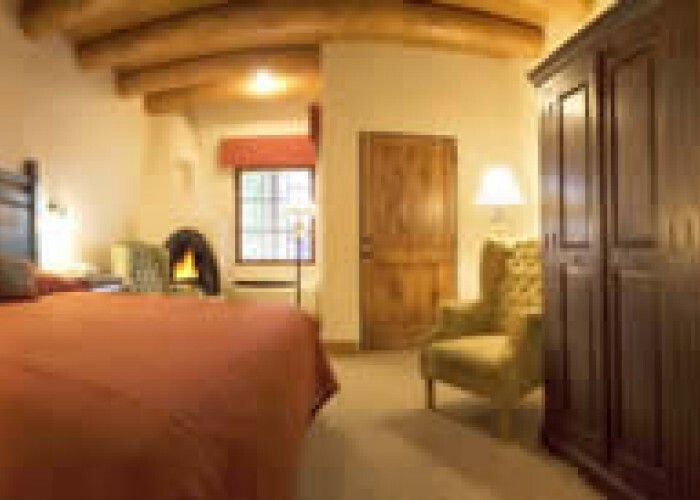 Handsome and calm interior with plush navy comforter, gold accents, with cholla cactus wood furnishings. 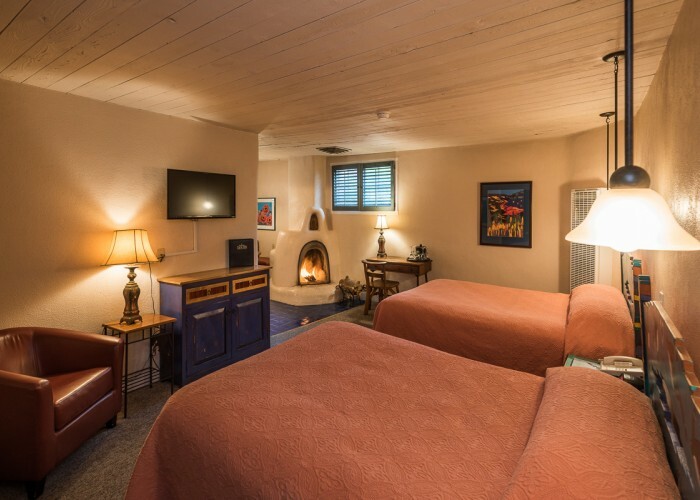 Features a gas burning fireplace, writing desk, sofa chairs, high speed DSL, and a quiet enclosed patio. 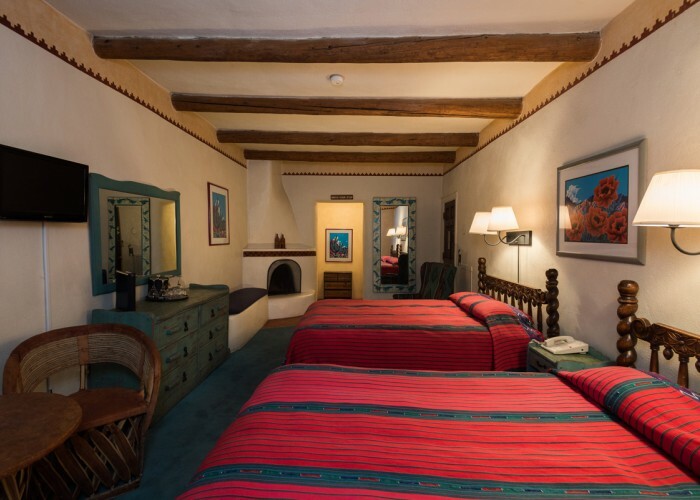 Plush king room with beautiful reclaimed timber headboard, hand painted full length mirror, pueblo style gas fire place, sofa chairs, writing desk, high speed DSL, and art by Taos painter Miguel Martinez. 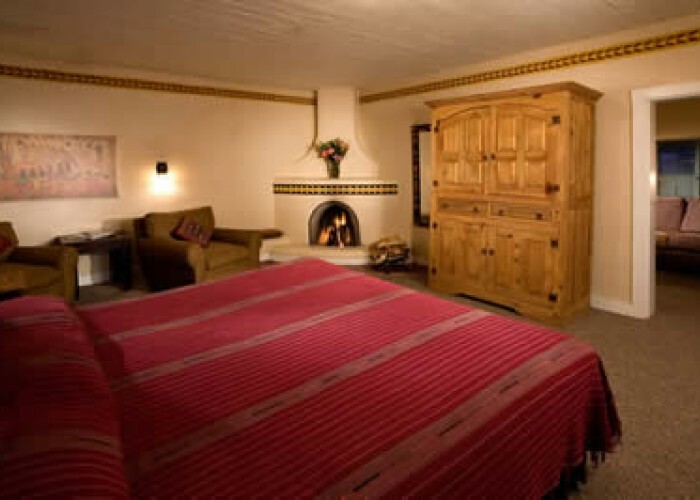 A romantic corner room decorated in red and tan. 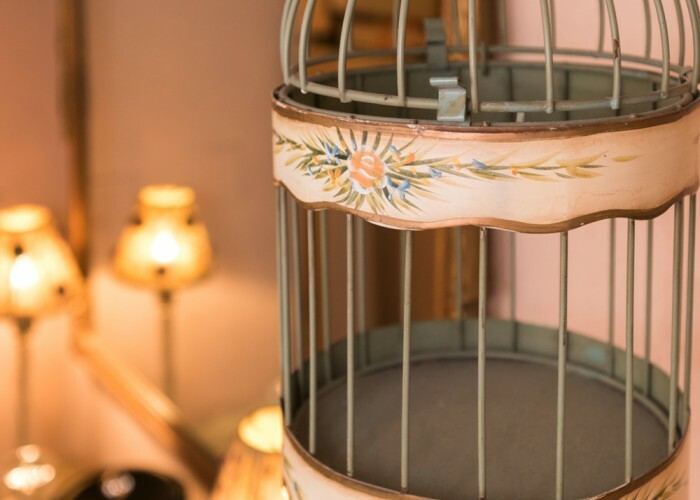 Furnishings include a grand sacred hearts armoire, ornate antique round end tables, a writing desk and chair. 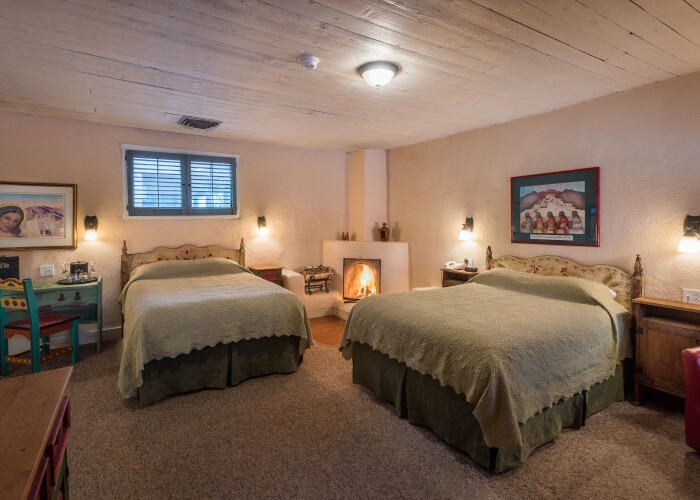 The art of this room is a pastoral forest scene done by Taos Artist Ila McAfee. 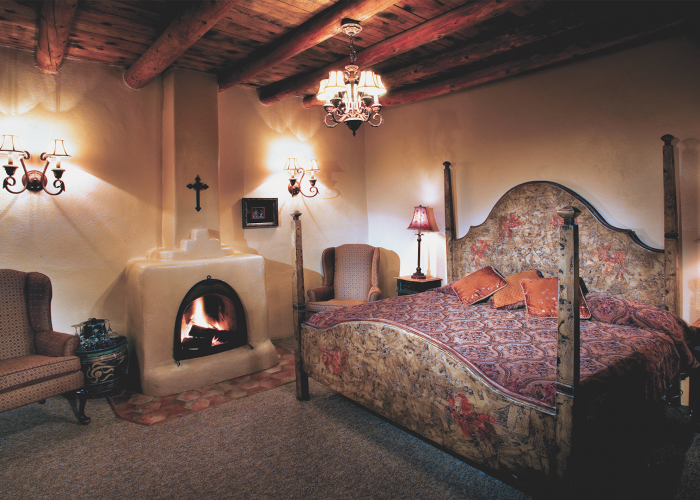 Two lounge chairs sit in front of the pueblo-style gas fireplace. 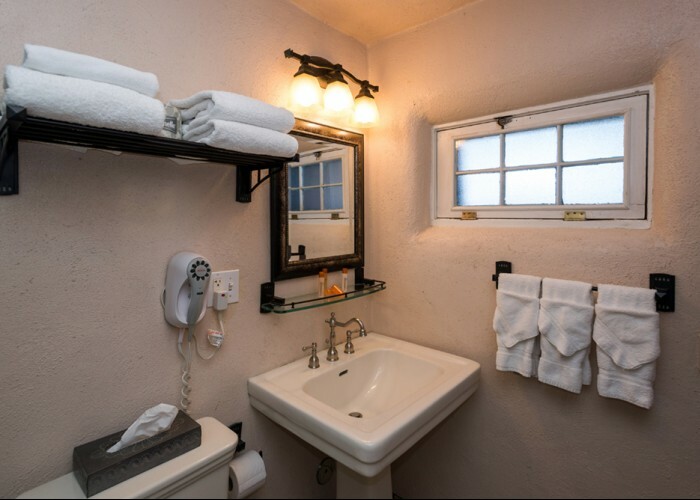 ADA amenities.